The shirt dress is almost always a good go-to piece, no matter what it is that you're doing, and I feel like most women know that. 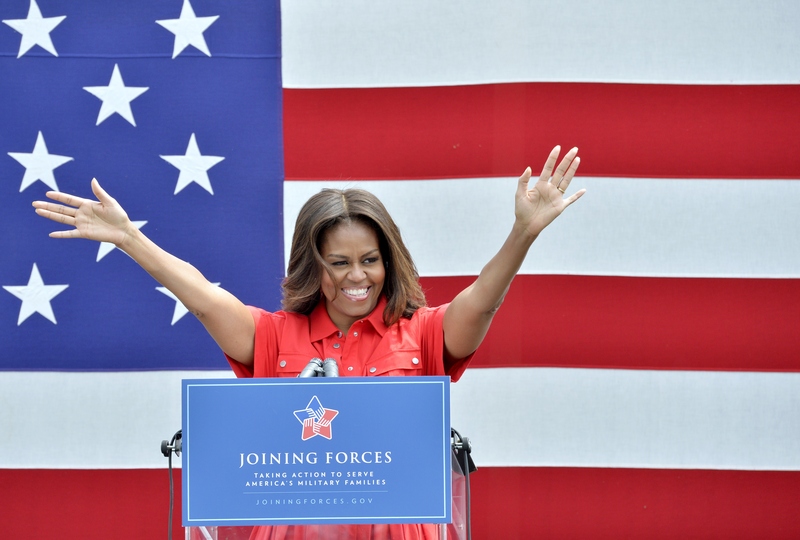 Example A: Michelle Obama's red Michael Kors dress from her trip in Venice. When the First Lady arrived on the U.S. and NATO Military base, she was dressed for anything, and I'm sure it felt nice to strut her stuff in something so simple (and comfy). After spending the week in primarily European labels, Obama returned to her classic Michael Kors wear, and chose a really great dress to do it in. The red shirt dress featured a pleated skirt and silver button detailing, which is something I really love (but who doesn't?). When the dress has the detailing, it makes accessorizing easy because you don't need anything else. You just slip on the dress and go. Not to mention the fact that the color was perfect — patriotic without the full flag plastered on her chest. I don't know if she knows, but red is really a FLOTUS color. I've said it before, and I'll say it again: clothes that work for me are clothes I want to wear. And a shirt dress like this is something I want to wear. Shirt dresses aren't groundbreaking by any means, but this one features a great waist-cinching detail that'll highlight any body, just like it did for Mrs. President.